A while ago, I said that one of my New Year’s resolutions was to foodblog more often. It’s a little more complicated than that, so let me try to explain. One of the pillars this food blog is based on is the concept of “seasonal cooking”. I want to see if I can cook seasonally for an entire year by using, for the most part, ingredients primarily sourced from Union Square Greenmarket. There may be other vendors I’ll be buying from for the duration of this blog project, but the majority of meals and dishes that you’ll be seeing on this food blog for the next 49 weeks or so will be based on ingredients from our local farmers, fishermen, cheesemakers, dairies, bakers and butchers. There are exceptions however, like citrus and chocolate. That being said, I’m not going to sweat it if I break my rule every so often. While I already do practice my commitment to seasonality to some extent, I’ve never taken it to the next logical step, which would be to try to do it for longer than two or three months. And while I’m kind of a hybrid locavore, there’s no way I’ll ever be as committed as Kaela of Local Kitchen (who, by the way, has a lovely blog — please check hers out). A project of this nature demands a post rate of more than once every two or three months. In fact, it requires at least three or four posts a week. If it helps me become less of a procrastinator, especially when it comes to food blogging and being part of the food blogging community, then that can only be a good thing. Sometimes all that’s required is just a light tap on the shoulder and a little encouragement. Maybe later in the year, we can talk about a couple of things that I find attractive, interesting and a little bit intimidating all at the same time, like bread making, and canning and preserving. At the same time, please don’t forget to pray for my sanity since it’s only the fourth week of January. You can be sure that by the time the first week of March comes around, that I’ll be jumping for joy at the first sign of GREEN vegetables at the farmer’s market. Although I’m not a vegetarian, this food blog features a large number of vegan, vegetarian and vegetable-focused recipes, the latter of which can be quickly modified by omitting one or two ingredients. 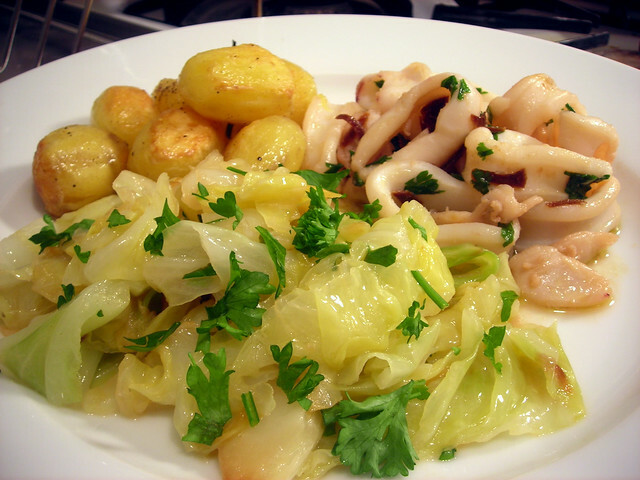 For example, the potatoes are vegan; the cabbage can become vegan by substituting olive oil in place of the butter. It’s my hope that if someone were to stumble upon my food blog unbidden, that the least I could do would be to offer something of value to anyone who happens to visit this site. These recipes serve two people (or one ravenous eater), so you may have to play around with proportions and cooking times a bit if you’re cooking for more people. (1) — if you use larger-sized potatoes, you will have to adjust the par-boiling time and the roasting time. In addition, you may have to slice them into more manageable pieces. Place the potatoes in a saucepan with some cold water, and a generous pinch of salt. Bring to a boil, then reduce heat to medium-low and simmer for 5 minutes. Drain into a colander; potatoes should be barely cooked through. 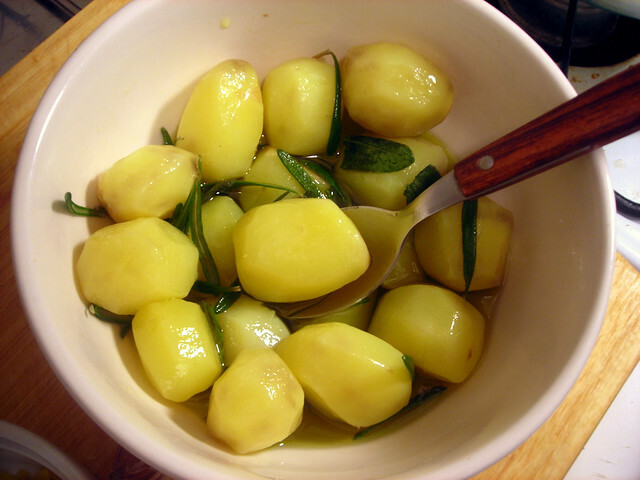 Place potatoes in a bowl and pour enough olive oil to cover them by half way. Add rosemary and sage. Stir, then set aside. 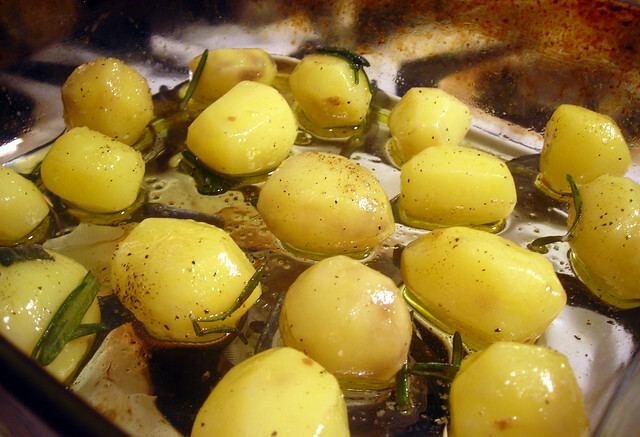 Let the potatoes marinate in the olive oil for about 15 to 20 minutes. 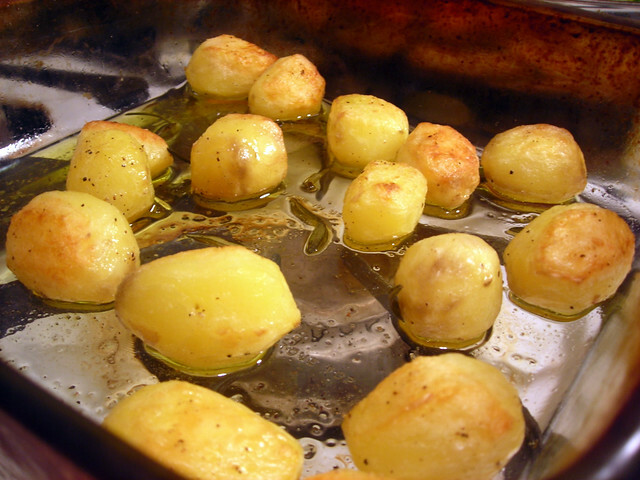 When you’re ready to proceed, pre-heat the oven to 350 F. Season the potatoes with salt and pepper. Arrange them in a Pyrex baking dish or roasting pan. Roast the potatoes at 350 F for 30 minutes. Give the potatoes a stir once or twice to ensure that they brown evenly on all sides. When potatoes are done, transfer to a warmed serving platter. You’ll want to serve these as soon as you are able, since the longer they sit, the sooner they’ll lose their crisped coating. Time: About one hour and 15 minutes, including prep. Melt butter in a large skillet over medium heat. 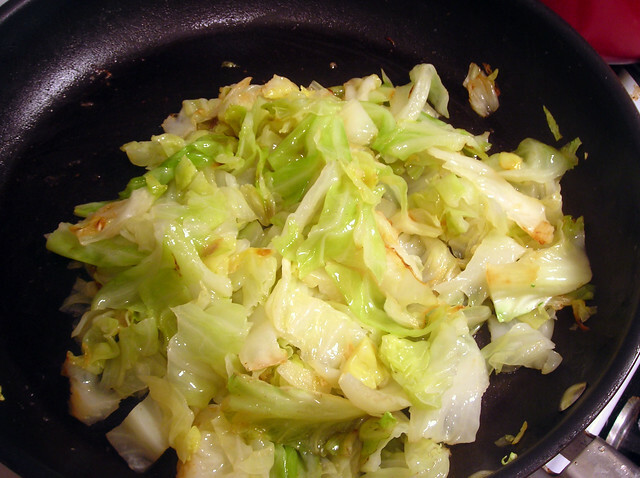 Once butter is melted, add cabbage to the pan along with a pinch of salt and the water. Lower heat to medium-low and cover. Cook cabbage for 25 to 30 minutes, or until all of the liquid has evaporated. Taste for salt and pepper. Stir in lemon juice, if desired, and some chopped fresh herbs of your choice. Serve at once. Note — You don’t have to use French butter. I like French butter because of the higher butterfat content and because of the taste. If you choose to use regular unsalted butter, Land O’ Lakes is a good American brand. Place squid in a small bowl. Stir in a generous pinch of kosher salt. Mix well, then set aside for at least 5 minutes. When you are ready to proceed with the recipe, gently warm olive oil in a large, shallow pot over low heat. Add garlic, bay leaf and lemon zest. Simmer five minutes until fragrant. Add squid to the pot. Cook, moving the squid in the oil so that it cooks evenly until it becomes opaque and the tentacles turn lavender, about 2 to 3 minutes. Taste for salt and pepper. Stir in a little lemon juice if desired, and scatter some chopped parsley. Serve at once. Time: 15 minutes, not including prep. The potato dish and the cabbage dish are my entries for Weekend Herb Blogging #318, which is hosted by Cinzia of Cindystar and organized by Haalo of Cook (almost) Anything at Least Once. Weekend Herb Blogging is a weekly foodblogging event that was originally begun by Kalyn of Kalyn’s Kitchen. 25 Jan	This entry was published on January 25, 2012 at 3:35 am. It’s filed under cooking, food, food photography, vegan, vegetarian, winter and tagged cabbage, gluten-free, potatoes, squid. Bookmark the permalink. Follow any comments here with the RSS feed for this post. I do agree with your resolution to seasonal buying & cooking, we should try to do it forever. I’ve just read a note from a friend of mine on FB about a funny (but pretty sad) scene at the vegetable market in Milan this morning: two ladies were discussing and complained because of the expensive prices of apricots, peaches and cherries on the counter … but still they were buying them! So I appreciate your effort, and love the cabbage recipe … I am on a detox diet at the moment but hope soon to try it!